The Evergreen State is an outdoorsman’s paradise. Mountains like Mt. Rainier, Baker, St. Helens, The Olympics and Cascades lure snow sports enthusiasts and year-around nature lovers. Mighty rivers like the Columbia and Snake as well as the Skagit, Snohomish, Skykomish, Puyallup and others are great for fishing and bird watching. Lake Washington, Seattle’s pride and joy, Lake Chelan and smaller lakes are impressive.The three largest cities are Seattle, Spokane and Tacoma. Some good-size cities are Bellevue, Bellingham, Everett, Federal Way, Lakewood, Vancouver and Yakima. 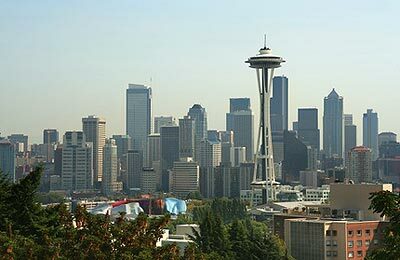 The overall population of greater Seattle is about two million. It encompasses cities like Renton, Kirkwood and Redmond. Numerous cities and towns bordering Puget Sound or are near it offer waterfront docks with cruise ships, charter boats and ferries waiting to help visitors investigate this magnificent region. Destinations not to miss are the North Cascades, Olympic Peninsula, Pacific Ocean beaches, San Juan Islands, Mount Rainier and Mount Baker. Two well-known dams in the state–Grand Coulee on the Columbia River Plateau and Bonneville Dam are worth a visit. Some points of interest on the coast are Ocean Shores, Westport and Long Beach, a 26-mile stretch of vast ocean shore. Long Beach has been compared with Cape Cod on the East Coast. Westport is home to a 100-year-old lighthouse and a maritime museum. Sightseeing is great on the Olympic and Kitsap Peninsula. Some interesting towns to check out are Port Townsend, Port Angeles, Sequim, Bremerton, Port Orchard and Poulsbo. Port Townsend is famous for its restored Victorian mansions and 19th century buildings. 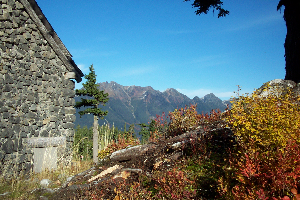 Hikers enjoy treks in the Olympic National Forest and Olympic National Park. Five enlightening visitor centers have been established on the highway to Mount St. Helens which endured a major eruption in May 1980. Mount Rainer National Park opened over 100 years ago with 265,000 acres of glaciers, old growth forests, meadows, wild flowers and more. Other winter sports areas, popular with skiers, are Crystal Mountain and White Pass, Stevens and Snoqualmie Pass. Walla Walla in Southeastern Washington has gained national recognition as an appealing place to visit. Spokane has been called the heart and soul of inland Northwest due to its indoor things to do and outdoor activities. These are only samples of places to go and things to do in the Evergreen State. In all seasons Washington is hard to beat as a getaway, sports-related experience or a needed vacation.